The weekly or monthly updates that appear in my e-mail account from various journals that I have subscribed to serve as a reminder that every single day we are expanding our knowledge and adding to the repertoire of scientific conquest. Sometimes reading these papers, however, is a chore… Not every paper is well-structured, not every project deserves the attention that it receives, and not every study stands the test of time. Every now and then however, I read papers that leave a profound mark on how I view biological systems. These studies are not necessarily large-scale or even complex but the mere act of reading them changes my way of thinking. The transformation may be nuanced or not even noticeable, but the effects will remain… for a while. If pressed, each scientist may come up with a unique collection of such publications–what we find exciting is ultimately a subjective matter–but I think we all, to some extent, can appreciate the underlying attraction. For me, it all comes down to the phrase: “the importance of cellular processes in regulating RNA structure.” We have read about numerous examples where the structure of RNA acts as cis acting factors in RNA biology, however, thinking of RNA structure itself as an intermediate target of regulatory programs on a whole-transcriptome level is very intriguing. I always suspected this much but reading this sentence just toggled a switch in my head–in a good way. 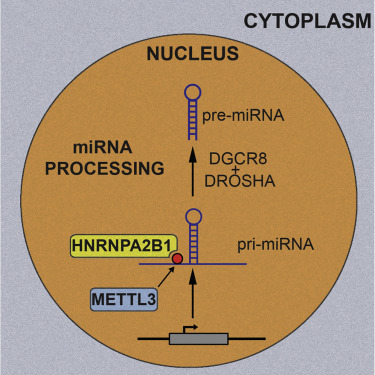 DMS signal in RPL33A mRNA shows a region that is unstructured in vivo but forms a stable structure in vitro (Rouskin et al, 2014). This statement, despite being more descriptive, tells a similar story. And I think this is a very important hypothesis. Understanding RNA structure as a dynamic phenomenon in the cell, and not just a byproduct of thermodynamics coded within the sequence, with far-reaching regulatory consequences opens up a new field of research studying transcriptome-wide consequences of factors that affect RNA structure and their functional consequences. On the surface this statement contradicts those reported by the Weissman lab. However, this latter study was using de-proteinized RNA and as Rouskin et al. 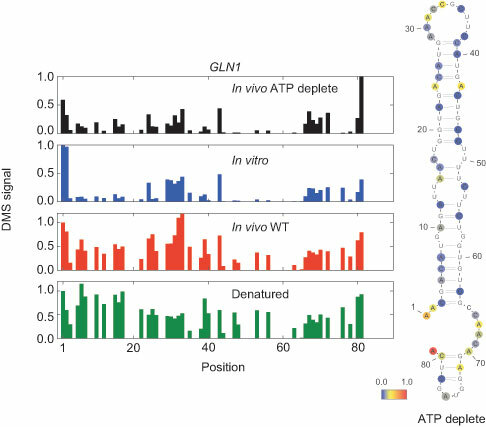 have clearly stated: “analysis of mRNA structure under ATP-depleted conditions in yeast shows that energy-dependent processes strongly contribute to the predominantly unfolded state of mRNAs inside cells.” So the observation made by Wan et al. is a consequence of the in vitro nature of their study. If it turns out that the differences between in vivo and in vitro RNA secondary structures are pervasive, as Rouskin et al. suggest them to be so, we need to rethink how much stock we’re willing to put into the descriptive studies that have reported on RNA structure using in vitro methods. Ding et al, 2014. In vivo genome-wide profiling of RNA secondary structure reveals novel regulatory features. Nature 505, 696–700.